Without a doubt, this is my new summer hair style. Just throw my hair up in a messy bun and at a head wrap for a touch of cuteness. Easy breezy does it when it comes to summer hair for me. Hope you are having a lovely Tuesday! It's hard to pick a favorite look of yours, Bonnie, but I think this might be mine. I love the double polka dots, the blue and red and that cute head wrap. I have a LOT of heavy, curly hair and so I could not agree with you more! Stay cool girl! Your too cute. Love your dress!!! I was watching your Q&A on YouTube from a couple yrs back! Definitely time for a new one!! Your style is adorable!!! You look adorable. Love that dress. I'm trying this hair style asap :) Adorable! you look fantastic! !and like on my english-teacher on this photos only! love this :) so pretty! Cute as a button! Love it. Can't believe that dress is vintage, the cut is so modern! I love anything nautical, I just did a totally nautical themed post on my blog, have a look! I'm also doing a give away this week! i love your hairstyle and the dress is so cute too! Très rétro, love it ! You look SO cute with your hair up like that! And the dress is so cute, looks perfectly cool and breezy for summer! that dress is so sweet! yep, you are officially THE cutest. too cute!! love the hairstyle, i've got to get some cute head scarves for summer! Love the head wrap. I've always thought a scarf was too much for a small head like mine. This is exactly what I never knew I needed. Very breezy. Your shoes are so amazing! I keep meaning to get a pair like that. love the dress and how you did your hair! This is such a retro outfit! You look so cute! I am with you with the easy breezy hair, especially with the crazy humidity we were having. You always look so adorable! I love this whole look. Love this super chic retro luck! Ahh, too cute. Love the messy bun with head wrap! 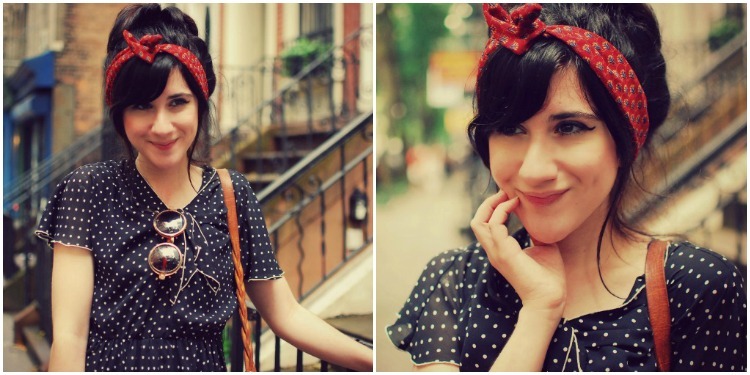 You make me want to get bangs and a polkadot dress! This such a darling look, love the red scarf! that's my go to look! i'm diggin' the head scarves this summer bonnie. since we can't layer on the clothes cause of the heat, layer on the accessories! I absolutely LOVE your polka dot outfit! Fancy Look, so adorable, the dress and the style so retro, perfect. Thanks for this Blog. Such a pretty dress & your hair looks fab! So cute! The messy updo really helps when it's super hot! Loving your dress and sunnies. Beautiful choice! Awesome article and straight to the point. I definitely believe what you stated! I do like the messy bun. It's so comfortable to wear too. You look great. Love the polka dot dress! It looks great with the scarf in your hair! Super cute outfit! And great idea for hair! Bonnie you are so perfect!! IN LOVE with your style! Love this chic & retro look, especially your new hair style. Perfect for summer . Great look! Love the hair wrap!